I pretty much always have a green smoothie for breakfast. Do I also make Todd have one? Yes. But he doesn't mind how bossy I am, because my green smoothies are delicious. And they are good for you. And they are delicious (the part Todd cares about). These green smoothies are especially dear to my heart because they can be packed full o' spinach and no one would ever know...besides the colour...kind of a giveaway. I always add flax because it's a great way to get some omega-3's in, I also usually try to add spices for some antioxidant power, a little splash of vanilla, and a small sprinkle of pink Himalayan sea salt. A breakfast including a couple servings of fruits and leafy greens is always a good way to start the day. I also use homemade almond milk. How snotty can you get, am I right? This milk is so not at all like store-bought almond milk. It is delicious, and creamy, and fresh (unlike cartoned almond milk). And I swear it's not hard at all, though it does take a minimal amount of planning. Later this week I promise to show how to make your own almond milk and why you should, and my lessons learned along the way. Here it is in all it's milky, mason jar glory. Bob stares at me like this when I make it. So here it is. 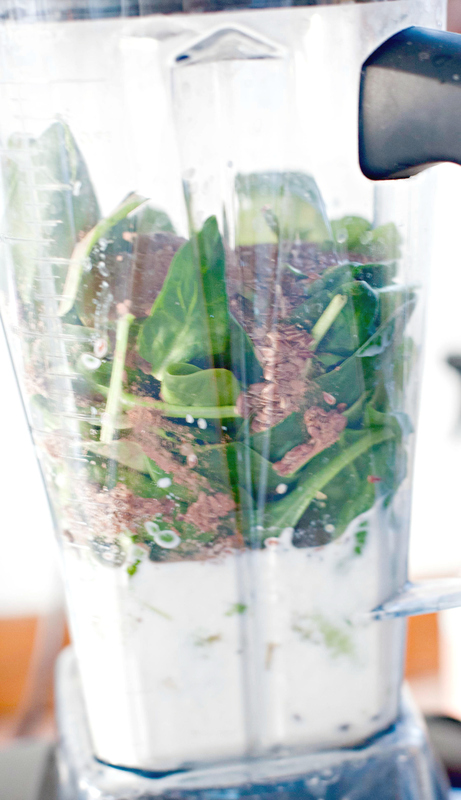 You can modify this smoothie to what you have on hand, of course. Start by adding the milk first and then throw everyone else into the pot blender and get to blendin'! 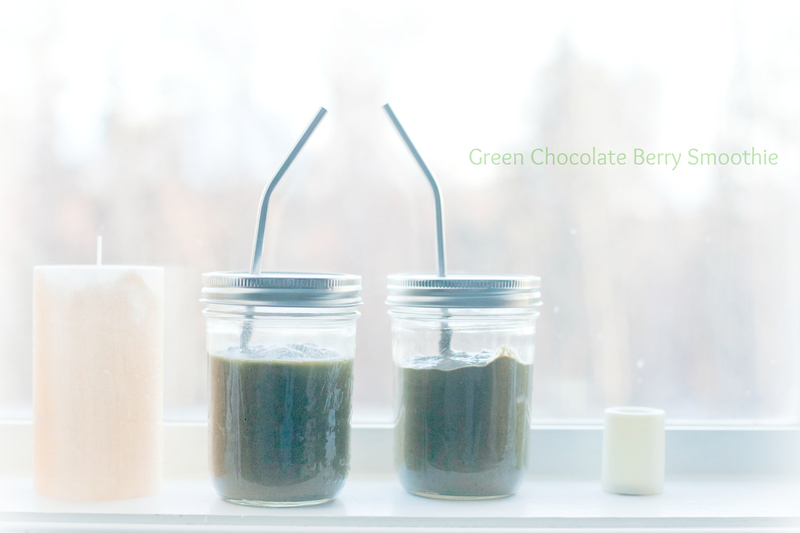 Pour into adorable mason jar travel cups with steel straws that your husband made and sip away in delight (okay, the former isn't really required but definitely the latter). Why don't I add other little goodies like spirulina or maca powder? Well for one, spirulina isn't actually good for you. *gasp* I know, I had just bought a little baggie of it! You too can learn about spirulina, and why it's maybe not the best. And as far as exotic ingredients go...Alaska doesn't offer much in terms of that stuff. Sometimes I am able to get some fun things from Amazon.com, however...but you won't find super hard to find ingredients in my recipes mainly for this reason. And for those that are wondering why on Earth I put loose leaf tea in my smoothies...well, you can't taste it for one and tea does all sorts of wonders for your health. Do you know why matcha ( the finely-ground green tea leaves) are so good for one's health? Because the entire leaf is consumed! Any science anyone could ever want to know about tea can be found here. And in case you wanted to know why an artificial sweetener junkie like myself pretty much only uses erythritol now, follow the links.